The Birkie is soon here. The long range forecast for Cable, Wisconsin calls for a start time temperature in the teens with a high of 33 later in the day. That’s when many of us who aren’t elite wave skiers will still be on the snow, and those of us who are classic skiers may be stuck in a quandary. Will the temperatures rise through three different grip wax ranges? Will the grip wax be a Swix VR 40 or 45 at the starting line? Do we slog through to main street with our original kick wax? Do we stop at OO and cover with a Rode Multigrade? What about a Start blue or purple Oslo? 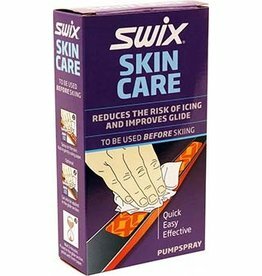 For those of us who are classic racers on skins, our race day wax choices are reduced to glide choices and covers. When temperatures approach the low 30s and the snow begins to transform into wet conditions, a skin cover of Rex Hydrex may well be the difference between a waterlogged skin and a skin that grips up those final climbs and across Lake Hayward. And having a responsive ski can help stave off cramping around 40 to 45k. Maintaining solid grip and fast glide reduces the chances of cramping and making the last 10k tolerable, not torturous. 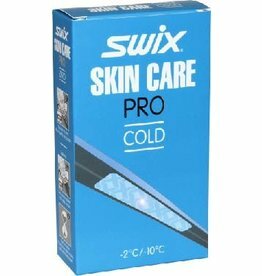 Given the changing conditions forecasted for The Birkie a skin ski may very well be the best ski of choice for non-elite classic skiers who want to have great kick for the entire race. Lucky for us, all major ski brands now offer top end classic racing skins. I have raced skins since 2016, and 70 to 80 percent of my skiing this season has been on skins. So Adam and Matt asked me to do an “apples to apples” test of these top end racing skins. 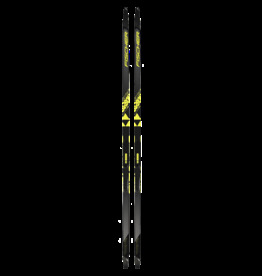 Test #1: Salomon S Race Skin (206 cm, 44-44-44 sidecut). Time: 9:55. Comments: The ski fit was slightly on the stiff side, so I had a few slips on the steeper inclines. It ran quite fast with no drag, even outside the tracks. A very stable ski. With a precisely fitted ski, it would have had solidly consistent grip and run just as fast. This is a strong all-around ski. Test #2: Atomic C9 Skintec (202 cm, 37-44-34 sidecut). Time: 9:50. Comments: This was the easiest ski to collapse with the climbs seeming effortless. It also released well without any drag. It was somewhat squirrelly at times. I attribute that to the narrow sidecut and the 202 length. A 206 would be a better fit for me. However, I skied this skin for 25k a few days later, and I quickly adapted to it and found it stable. This skin should be a potential top choice for the skier who sometimes struggles with kick and wants a fast racing ski. Test #3: Fischer Carbon Twin Skin (202 cm, 41-44-44 sidecut). Time: 9:50. Comments: This ski felt stable and fast from the start. It also gripped solidly without any drag. It has the new turnamic binding that allows for shifting forward and back, enhancing either glide or grip, depending on the skier, the snow conditions, or the course. 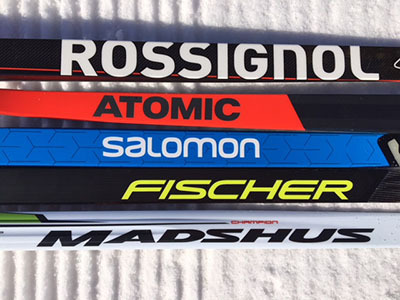 Like the Salomon, this is an excellent all-around racing ski. Test #4: Madshus Nanosonic Intelligrip (210 cm, 44-42-44). Time: 9:40. Comments: Very fast and responsive. It grips extremely well when over the ski. When I wasn’t on top of my stride, it released and slipped some. This was good “ski feedback” to stay on form. This NIS plate with an NNN binding allows for adjusting the forward and back settings, thus resulting in its adaptability. This should be a top consideration for the confident classic skier who wants top speed and can collapse the kick zone. It is also very stable in and out of the tracks. 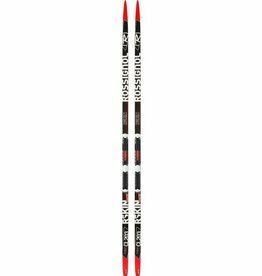 Test #5: Rossignol RSkin (203 cm, 44-44-44-40 sidecut). Time: 9:45. Comments. Fast, highly stable, easy to kick. The turnamic binding offers the same advantages mentioned in the Fischer comments. It seemed to run like a waxable classic ski when one hits the right grip and glide wax. When fit properly and the best binding setting is found, this is a top all-around ski. My main take away point is that all of our top end race skin skis perform great when they are fitted well to an appropriate skier. What this means is that the most important consideration with any ski purchase is how that specific ski fits you. Sometimes, we as skiers have a preconceived leaning to a certain brand. Put that aside and focus on fit. I would race with all of the tested skis, confident of their performance as long as I had the right fit. 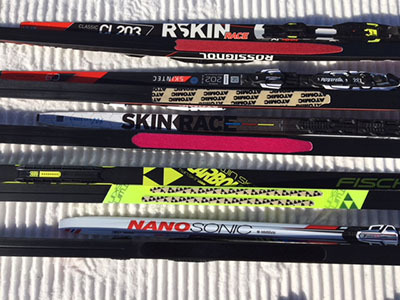 A skin ski may well be the best choice for the Birkie and the perfect “A” ski for many classic skiers. They ski well in virtually all conditions. 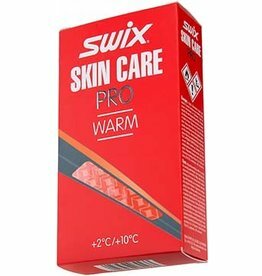 My recommendation is to leave the wax worry at home and add a skin ski to your fleet. If you do, you will have a ski that works and skis fast with minimal effort and no race day kick wax related anxiety. I will be racing this year’s Birkie on one of the aforementioned test skis.